A Real Estate Salesperson (Agent) is hired to facilitate a property purchase, sale or rental transaction on behalf of their client for compensation under the guidance and supervision of a sponsoring Broker. A Real Estate Salesperson is an independent contractor who is their own boss, sets their own work hours, and can make a great income. A Real Estate Salesperson is also commonly referred to as an “Agent”. An Agent or Broker is called a “Realtor®” if he/she is a current member of the National Association of Realtors (NAR) – a private trade organization. 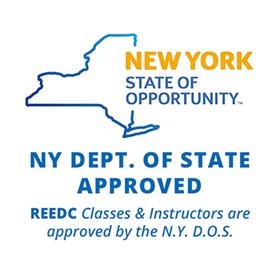 In New York, real estate professionals, including Agents and Brokers, are governed by the Division of Licensing Services of the Department of State (DOS). The DOS has the power to issue licenses and enforce real estate license laws through fines, suspension and revocation of licenses. Classes run on a rotating schedule, so students can typically start classes the following day. Classes run at each of our 3 locations daily, with school exams occurring every Friday. Students are required to attend all 20 class sessions, but can take them in any order. Jumpstart your career today! Get your real estate salesperson’s license. You can enroll for our Real Estate Salesperson course by registering online above, or calling us at (718) 339-7845. Getting your New York real estate license really pays off. After 2 years of working, salespeople have the option to take their careers to the next level by getting their broker license , where higher earning opportunities await.